Prayer and meditation are vital components of many people’s recovery, especially among individuals utilizing spiritual programs centered on the 12 Steps. Such techniques help people in sobriety stay grounded, seek guidance, and remain accountable to a power greater than themselves. One could easily argue that spirituality is the glue that holds a person’s recovery together. Given that addiction is a disease of the mind, a form of mental illness, it stands to reason that mediation can be a useful tool for people struggling with other conditions. Serenity is vital for anyone, to be sure, but is especially crucial for those who have difficulty dealing with the stressors of quotidian life. If one is unable to cope with stress, they are far more likely to resort back to drugs and alcohol for comfort. The same reality is real for people who meet the criteria for depression, anxiety, and bipolar and post-traumatic stress disorder or PTSD. 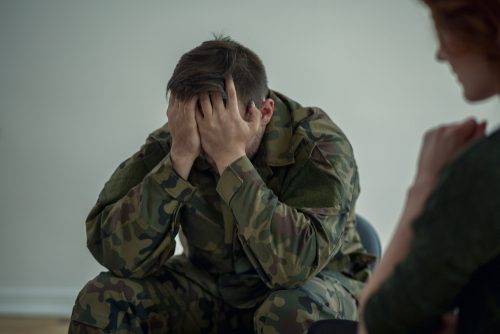 The Department of Defense sponsored an experiment to determine the efficacy of mediation as a therapeutic approach for managing the symptoms of PTSD. The study is essential for at least two reasons. 1) PTSD is a condition that affects many people with alcohol and substance use disorders. 2) Service men and women with PTSD are at high risk of turning to drugs and alcohol to cope with their symptoms. We observed Veterans Day earlier this week. With respect to the fact that many veterans are battling PTSD, we feel it vital to discuss practical ways of managing the condition. After all, many of Hope By The Sea’s clients are affected by co-occurring post-traumatic stress. While the debilitating mental health illness is most commonly associated with those who serve in foreign conflicts, the reality is that any form of trauma can preempt PTSD. While exposure therapy – purposely recalling traumatic events and confronting emotions – is the Department of Veterans Affairs’ preferred method of PTSD treatment, it is not always effective, the Associated Press reports. The researchers involved in the DoD study say that meditation could be more useful for those who do not respond to exposure therapy. The study appears in the journal Lancet Psychiatry. 61 percent of the meditation group improved on a standard PTSD assessment. 42 percent improved in exposure therapy group. 32 percent improved in the nutrition and exercise group. If you are battling the PTSD symptoms and substance use disorder, please contact Hope By The Sea. Our dual diagnosis or co-occurring disorder treatment program often relies on a combination of group and individual therapy, recreational therapy, nutrition and exercise, support groups, medication management, family therapy, and aftercare planning. We can help you or a loved one experience the miracle of recovery!